Utilize the space on top of your refrigerator – you can store organizers and fill them with canned food, pasta, and other supplies. Also, use the tops of kitchen cabinets. Build removable shelves above the washer/dryer, inside your closet etc. You can also hang hooks you can utilize for lightweight items. Just make sure you remove them and cover up any holes before you move to another apartment. Put your preps in antique trunks that can be used as end tables, ottomans or footrests with inside storage, etc. You have space under the bed, on the floor of the closet, under your couch and on closet shelves. Use the extra space in your entertainment center for storing supplies. No one will be the wiser. Buy a shoe bag and hang it on the inside of your closet door. Those little pockets can hold an amazing amount of stuff. Extra prescriptions, medical supplies, baby wipes, or food. Candy, dried fruits, etc. Whatever you want to store that is small enough to fit and not so heavy as to tear the pockets. Create space over the toilet by installing a removable shelf. You can hang one on the inside of the bathroom door for extra supplies there too: bath tissue, peroxide, q-tips, etc. Instead of storing them empty, hide your preps in empty suitcases, purses, gym bags – you get the idea. I also store small items in empty pots and pans, covered bowls that are not used frequently. Use a longer tablecloth over your dining room table and you create hidden storage underneath. Cover a window with cardboard covered with material to look like a curtain from outside. Then put small shelves in the window, fill with goodies, and hang a curtain over it from the inside of the house. From outside it looks like a curtain, from inside it looks like a curtain. Fill sanitized 2-liter bottles three-quarters full with water and freeze. Fill any extra space in your freezer. A full freezer actually saves energy. As an added benefit, the extra ice helps during power grid failures, as your freezer will stay cold longer. After you use up your other stored water, you can begin using the ice water from the freezer. You can store your emergency bag or survival kit in the trunk of your car. If you have to leave town in a hurry, you will likely jump in your vehicle so you might as well store supplies there. If you are concerned about storing water in your car, see Should You Store Plastic Bottled Water in Your Car? Since you have supplies throughout the house, it is easy to lose track of all your hiding spots. Make a list of where you are storing everything. This way, when the time comes that you need to access them you can readily find what you need. 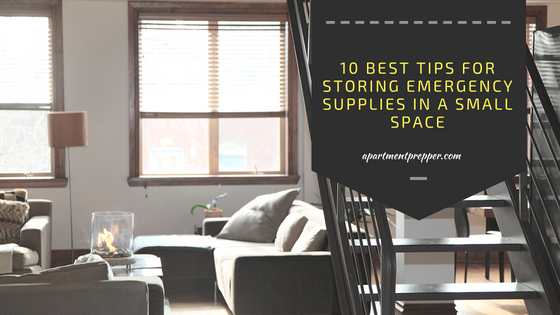 I hope this list has given you ideas for finding storage in a small apartment. If you have other hidden spaces, please share in the comments! I like the smaller one liter bottles over the 2 liter. They fit into my freezer better. I also added shelves overtop of closet doors. You will have a shelf overtop of the clothing bar. I turn around and added a set of shelves over the door. they are only 8 inches deep but I have 4 of them in a normally dead space. these shelves on and 2 metal strips and you snap the shelf support’s in to the strip and lay the board on them. You could do the same thing in the bath room and bed room as well. I also use wire racks on the regular shelves to give me more storage. I did this in all of the kitchen cabinets as well. You can use multiple clothing hangers as well. I have some that hold 5 shirts and 5 pants as well. These help to gain usable closet space too. I live in a studio apartment. I have use the “Command” removable hooks and they seem to work well as long as you clean the walls with rubbing alcohol like the directions say to do (yes it works best to read the directions). If you pull the drawers out of your bedroom dressers you will find that there is a small space behind the drawers and below the bottom one where some very thin and flat things can be hidden too. The space below the toilet tank and behind the toilet can be used too. You have some very good tips in the article. Hey Old guy, Those Command hooks are the best! Thanks for sharing these great space saving tips!